It’s been a year since I proposed the idea for this blog and the Inkpunks were formed. A whole year and while the time has flown by, we also can’t believe how much has happened for all us within that year. We thought we’d take some time to reflect back on the year with the Inkpunks. The most obvious change is that we’ve grown and we’re now at ten members, but that’s not all. We’ve also grown an astounding amount in publishing, editing and slush reading credits, we have increased our readership, have had people asking us if they could guest blog (crazy, right?) and most of all we’ve grown as a group dynamic and as individuals. It’s amazing what can be accomplished by the uplifting force of positive, encouraging people come together to support each other and the writing community. I have learned so much from my Inkpunks, not just about the writing world, but about life in general, that I feel blessed to know each and every one of them. In the last year, I’ve sold two stories, polished and queried a novel and written another one. Throughout the process, the Inkpunks have been there, to bounce ideas off of, to give critiques and most of all to provide encouragement along the way. I attended so many great conferences and conventions over the past year, all of them highlights for different reasons, too many to go into in this blog post. I’ve gotten to be on panels at World Horror, World Fantasy and VCon, which I love. The absolute best part was this year I DID get to meet every single Inkpunk in person and give them real hugs instead of virtual ones. Every Inpunk is now the proud (or embarrassed) owners of a handmade scarf from me. I decided to make scarves to match their personalities because we’re all so unique and I love that about us. Speaking of personalities, I split mine into two. I took my sandrawickham.com website and devoted it to writing and started a new one at sandrawickhamfitness.com that deals with my fitness career. I take this as a good sign, that I have enough going on with both that I needed two websites. What else? This past year I’ve joined the Functional Nerds as the Fitness Nerd columnist, along with several other Inkpunks who also double as Functional Nerds. I started a podcast series for Bitten By Books where I interview my favourite urban fantasy authors and I’ve been interviewed myself for several podcasts. I’ve also become a slush reader for Lightspeed Magazine. Another thing I’m proud of is that I’ve stuck with martial arts training. Last year at this time I would’ve been a gold belt, and now I’ve just promoted to my high purple belt. It’s helped me in my writing, I’ve sat on panels about writing about fighting and I can’t wait to keep moving up the ranks. It truly has been a great year. I know I am probably forgetting things to highlight (we had TWO Inkpunk weddings this year!) but that’s the great thing about having a group behind you, whatever I’ve forgotten, someone else will be sure to point out in their post. I keep a picture on my fridge that a friend’s daughter, Stephanie coloured. I keep it because it strikes me as an excellent example of how to live life every time I see it. At the top of the picture of a kitten, it clearly states, “Color all the spaces with a C gray. 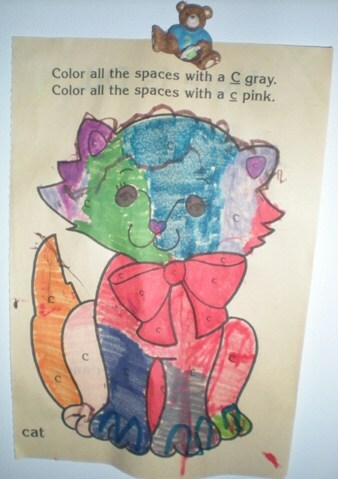 Color all the spaces with a c pink.” Stephanie has proceeded to colour the kitten with all the colours of the rainbow, blue, purple, red, orange, green and I love it. I think the kitten looks much more original, interesting and happy for its multi-coloured fur. That’s also how I think of the Inkpunks. Without them being such a big part of my life, I probably would still be colouring the proper sections with gray and pink. My Inkpunks make me want to colour with blue, purple, red, orange and green, in my writing and in my life and I know I’m a better person for it. Thanks to the Inkpunks and all of those who support us. We look forward to another great year. Sandra, this has been a POWER year for you! I am so inspired by what you have accomplished, what you are doing. You (and all the inkpunks) are exceptional examples of hard work, creative power, and friendship.